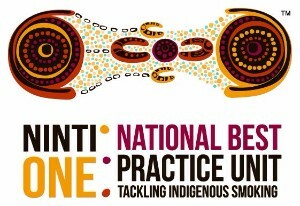 Welcome to the fourth update from the National Best Practice Unit for Tackling Indigenous Smoking (NBPU TIS). The NBPU TIS online resources are currently being finalised and will be launched in March. We will provide weekly updates to grant recipients in this format until the formal launch. Feel free to contact us as outlined below. Last Week Desley Thompson (NBPU TIS Manager) and Lyn Allen (NBPU TIS Project Co-ordinator) kicked off consultations with visits to a number of organisations in NSW with Penney Upton (Consortium Partner from Canberra University) joining them for the meeting in Canberra. 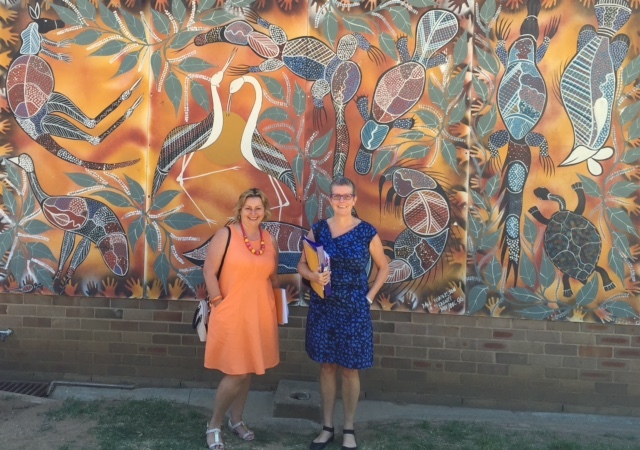 Penney (left) amd Lyn (right) in front of Winnunga Nimmityjah Aboriginal Health Service. This week Desley has been extremely busy with the continuation of consultations in the Northern Territory and will then finish off the week with a meeting in Cairns. Consultations are booked for next week in the South East QLD, Northern NSW and WA. 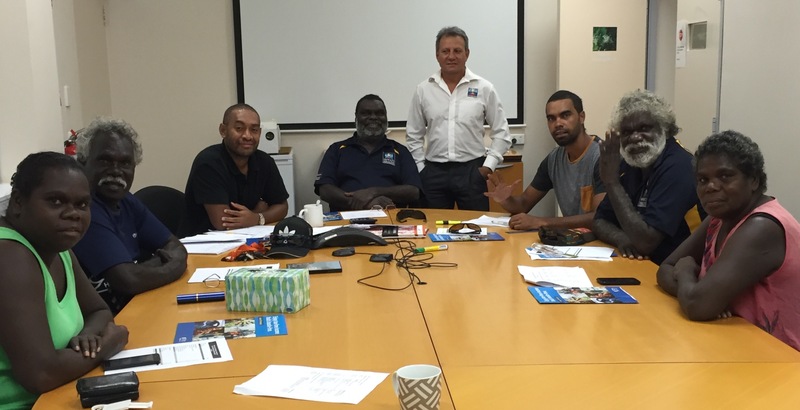 Yaka Ngarali (No Smoking) Team at Miwatj Health Aboriginal Corporation. Left to right: Justine, Oscar (1), Ben, Glen, Eddie, PJ, Oscar (2) and Julie. Thank you everyone for your patience during the organisation of these meetings and for taking the time out of your busy schedules to meet with us. So far, we have received very positive responses to the Unit plus gathered some excellent feedback from the groups. Upcoming workshops - Save the dates! The NBPU TIS will host the first national workshop bringing together organisations funded through Tackling Indigenous Smoking regional grants. The national workshop will be held on 11 & 12 May at Tandanya Cultural Centre in downtown Adelaide. We will be inviting organisation Chief Executives to participate and to bring TIS Program Managers. NBPU TIS governance meetings will occur in association with this workshop on 10 May. More information about agenda and activities as soon as we can. The NBPU TIS will also conduct jurisdictional workshops for each State/Territory over the coming months. Although we have not secured the venues for each of the workshops, the following dates should not change. NBPU TIS is looking for a Liaison Officer. The NBPU TIS Liaison Officer reports to the Manager, NBPU and will play a key role in connecting regional grant recipients with the support available from the NBPU. The position will also support the Manager, NBPU in the delivery of the action, communications and workforce development plans as well as impact assessment and grant recipient action plans. Attending face to face meetings, regional workshops and national workshops, the successful candidate will require strong cross-cultural and effective communication skills. Applications are encouraged from candidates with excellent project management and administrative skills and the ability to work collaboratively with people at all levels of an organisation. This position will be located at our Adelaide office.